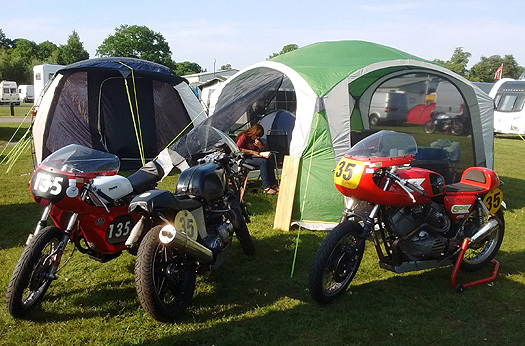 The Oulton Park experience at last. I have wanted to experience Oulton Park for years, and for the first time in a decade the CRMC had managed to book the circuit. The problem is that, except for a couple of big money events, the owners cannot use the circuit on Sundays, which rather messes up the weekend meetings that are the norm in classic racing these days. 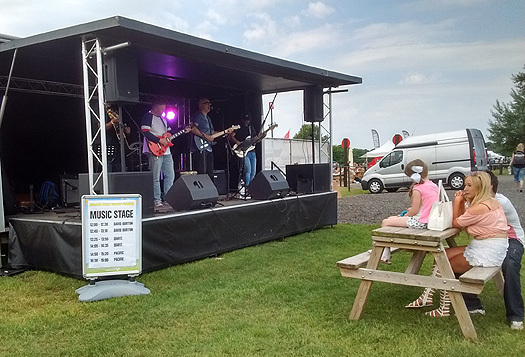 The solution was to use a Bank Holiday weekend, racing on Saturday and Monday, the paddock and surrounding areas being used for a general family fete type of event with food stalls, beer, a band and, as it turned out, just enough sunshine to make it all rather pleasant. 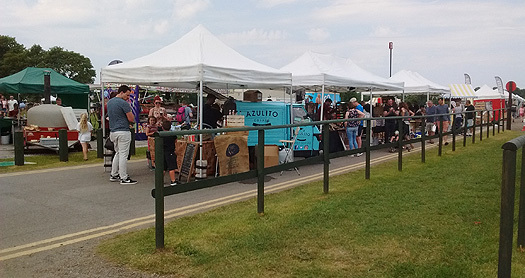 Lots of stalls selling food, drinks, crafts, flowers etc. 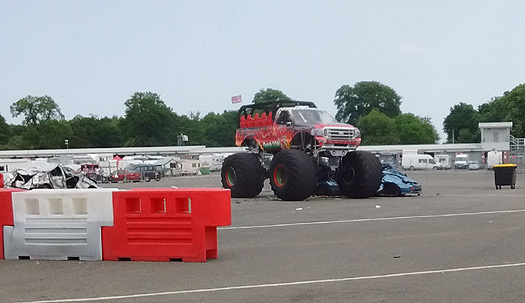 And mini Monster Trucks for the kids. So, what of the racing? Oulton Park is a very technical circuit that takes a lot of learning, so with no-one having had recent experience, except for a very wet practice day on the Friday attended by some, it was all down to who would remain confused the longest. That would be me then, more than likely. In the event, I was well off the pace to start with, but gradually got the hang of most of the bends. 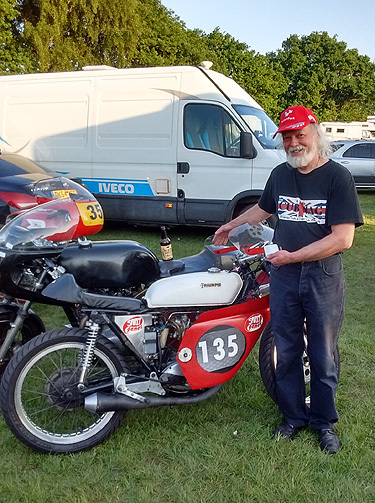 One could be taken flat out on the Cub, attempting the same on the Morini resulted in a 100mph trip across the grass, fortunately staying upright. 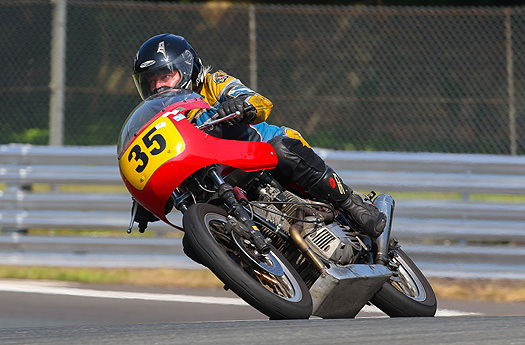 I kept braking too late into the chicanes and messing my line up on the Morini, that mid-corner stutter was back but the top end power was fine; my times were gradually coming down but I was still several seconds off the pace. 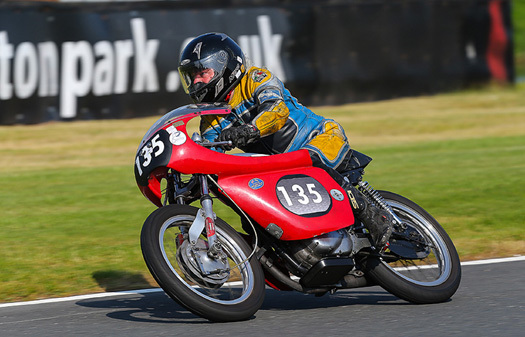 Oulton Park is a place where power really counts, so the Cub being simply not fast enough was understandable, but I had expected to be in the mix on the Morini. It wasn't for lack of trying! Still, I had achieved my ambition of riding at Oulton Park and there was the huge bonus of all three bikes still running at the end of the meeting. 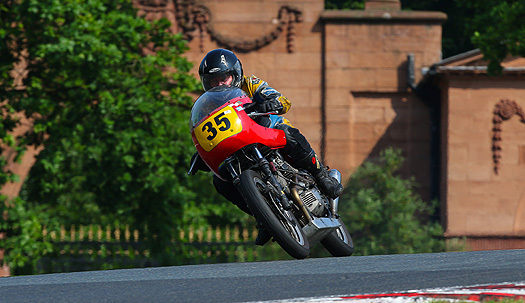 I had taken the 500 Triumph as a back-up, I took it out for the Monday morning test session, which was kept to less than two laps, but at least it can add Oulton to its cv. so I managed 3rd place to get a trophy and special hat.